Albania is a small country located in southeastern Europe, with Adriatic and Ionian coastlines. Visitors to Albania must get a visa from one of the Albanian diplomatic missions unless they come from one of the visa exempt countries or qualify for visa-free entry. Passports must be valid for at least 3 months from the date of arrival. Citizens from certain countries or territories are eligible for visa-free travel. Albania permits free import of 200 individual cigarettes, 50 cigars, or 250 grams of tobacco, 1 liter of spirits, 2 liters of wine, 250 milliliters of eau de cologne, or 50 grams of perfume. I bought my ticket to Albania from Austrian Airlines. I had gone to Albania for my holiday to see its beautiful attractions. I visited Rozafa Castle and Berat Castle which are beautiful castles with lots of history. Albania also has gorgeous natural views including two famous mountains; Mount Dajt and Mount Korab. The latter is the highest mountain in Albania and the Republic of Macedonia whose peak forms a frontier between the two countries. Be sure to visit Skanderbeg Square which is the main plaza in the center of Tirana and Albania Berat National Ethnographic Museum. There are many top places to visit in Albania. Places like the city of Berat located at the river Osum in the middle of Albania and the Albania Riviera where beaches are inviting. There are ancient ruins near the city of Fier. Durres, a major city on the Albanian coastline is home to the most important harbor in the country. There are also many other towns and cities to visit such as Gjirokastra city in the south of Albania, Kruja city in the northeast of the capital, Tirana city, and Shkodra city. These are some of the top places you can visit in Albania. Q. When is the best season to book an air ticket to Albania? A. 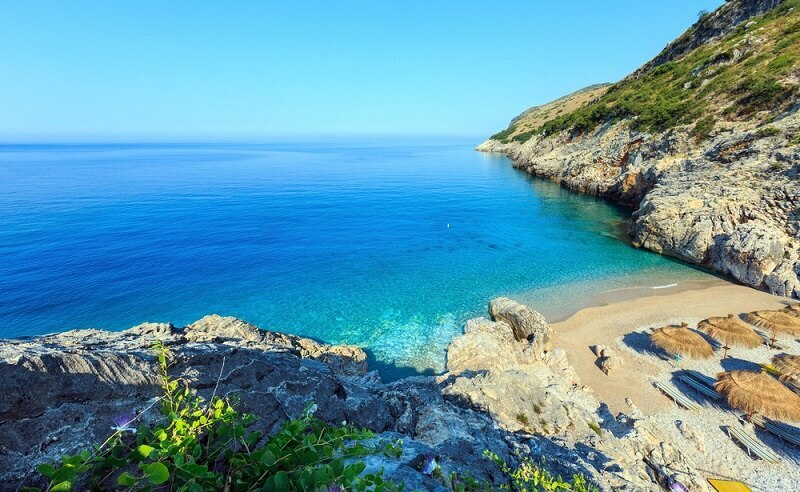 The summer season in Albania is hot which makes it the least favorable time to sightsee and explore the nature. If you are interested in sunbathing and swimming in the sea, then July and August are the perfect times to go to Albania. All other travelers hoping to do more urban activities, September and October are prime months for both weather and price. Temperatures are suitable for both sightseeing and sunbathing. Airports handling direct flights to Tirana International Airport • Frankfurt Airport • Bari Karol Wojtyła Airport • Istanbul Atatürk Airport • Vienna International Airport etc. Direct flights to Albania are available from airlines such as Mistral Air Airlines, Lufthansa Airlines, Turkish Airlines, Austrian Airlines, and Blue Panorama Airlines. The Mother Teresa International Airport, located 15 km from the city of Tirana is the main airport in the country.